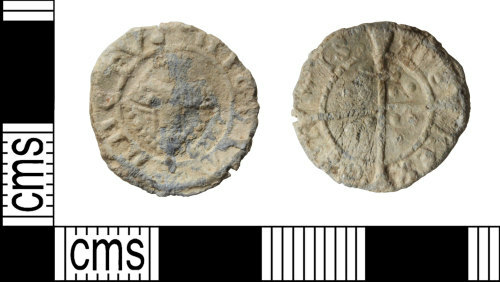 A complete lead medieval token of the Boy Bishop type, dating to the period AD 1400-1500. The obverse shows a mitre, surrounded by a crude legend. There is a solid long cross on the reverse with three pellets in each quarter, surrounded by a crude legend. It probably imitates a long cross penny, and similar to those listed in Fletcher's Leaden Tokens and Tallies, p31. Reverse description: Solid long cross, three pellets in each quadrant.